Watsonville, CA - A group of talented high school students are competing to have their artwork selected to represent the theme of the 2009 Santa Cruz County Fair. The four semi-finalists were given the task of turning "Barnyard Beach Party" into a piece of original art. "I am extremely proud of these kids" said Pam Falke-Krueger, Graphics and Marketing Instructor, "They are talented, motivated, and have a great future." The Fair's professional graphic artist Susan McBeth commented "These are great! I can't believe they were done by high school students!" McBeth is looking forward to using the winning artwork to develop the annual poster and marketing pieces that will be used to promote the fall Fair. Members of the community are invited to help with the selection by going to the Fair's website, viewing the four finalists' work, and voting for their favorite. 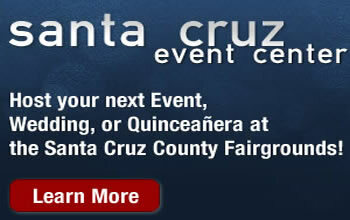 Simply go to www.santacruzcountyfair.com and look for the contest notice on Fairtime section. The four student artists are Skylar Merritt, Kayla Barros, Daniel Shady and Kate Lerman. All four attend Harbor High School and are enrolled in ROP computer graphic design and marketing classes. ROP is the Santa Cruz County Regional Occupational Program. Santa Cruz County ROP provides students with opportunities to acquire career training and technical skills to prepare for lifelong learning and success in the changing workplace. The Santa Cruz County Fair celebrates the rich history of the community and people and invests heavily in bringing this heritage to area youth. The 2009 Fair will be held September 15-20 at the Fairgrounds located on Highway 152 just east of Watsonville. www.santacruzcountyfair.com This year's theme is "Barnyard Beach Party."